Food allergies and food intolerances are a growing public health concern causing higher consumer demand of products that are tailored to meet special dietary requirements. Especially the market for gluten-free foods is rocketing. By 2020, the market is projected to be valued at 7.59 billion U.S. dollars. Conventional stores were estimated to be the most important distribution channel for gluten-free products in 2015 with sales amounting to about 2.79 billion U.S. dollars. According to industry experts, the United States was the flagship market in terms of gluten-free food retail sales in 2014. Italy and the United Kingdom rounded off the leading three consumer markets. In the United States, gluten-free food made up 2.8 percent of all food sales in 2013 and accounted for 6.5 percent in 2015 - and an end of growth is not in sight. That share equaled a dollar amount of about 13.76 billion U.S. dollars in retail sales. Within the gluten-free food category, Smart Balance Inc. (now known as Boulder Brands) was the key player in 2014. The company is located in Boulder, Colorado. 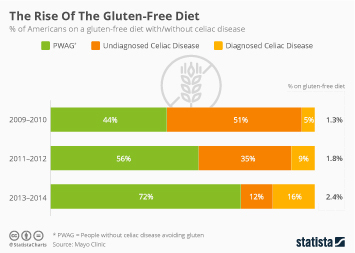 The target group for the gluten-free foods market includes people suffering from celiac disease or gluten sensitivity as well as people who are very health-conscious. On a North American scale, eight percent of people followed a wheat-free or gluten-free diet as of 2016. Staggering 64 percent of U.S. consumers indicated to consider such a diet as very healthy or somewhat healthy. The primary reason behind following a gluten-free diet was a gastrointestinal gluten allergy. More interesting topics from the industry "Organic & Health Food"